A series of small hills marks spectacular geomorphic scarps in the Tungchu area between Chihshang and Yuli (Fig. 2, see Fig. 1 for stop location). 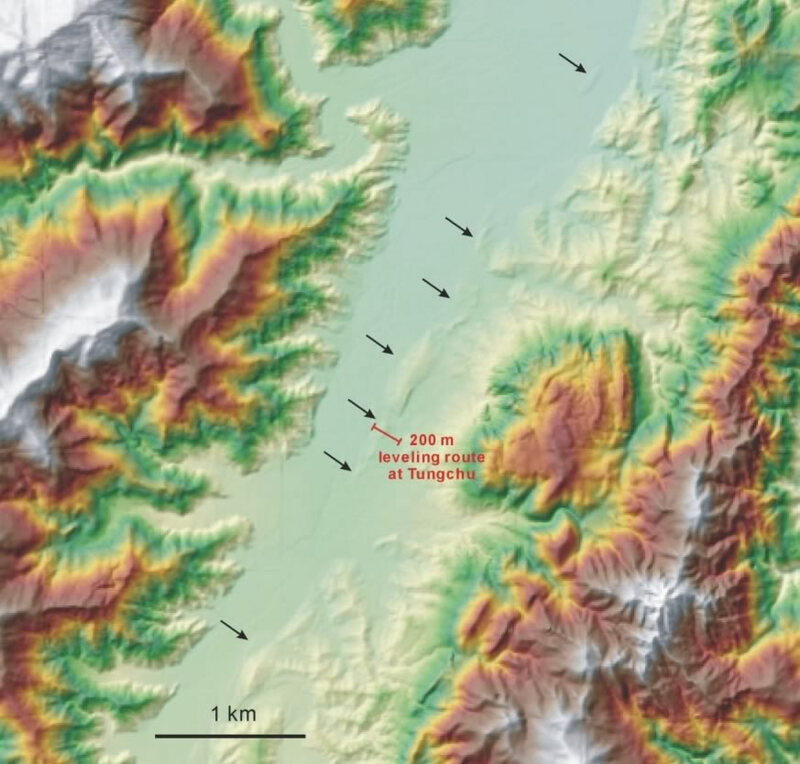 These scarps are considered as the surface trace of the Chihshang fault at its very northern end. No clear surface breaks of the fault have been observed, although a few pieces of cracks or fractures have been doubted along the scarps. A geodetic network across the scarp and the hill was deployed in recent years. The measurements included leveling, distance-angle measurements, and GPS. The preliminary results show that the hanging wall of the fault (i.e., the small hills) is indeed uprising (Fig. 3). The elevation change across the hill implies an anticlinal fold in the hanging wall as indicated by the topography. However, the eastern limb of the hill appears to be greatly modified by erosion of probably a stream parallel to the fault behind the hill. Shading relief of 40-m DTM in the Tungchu area. Arrows indicate geomorphic scarp at the foot of the rugged Coastal Range. This scarp is interpreted as the surface trace of the Chihshang fault at its northern end. A leveling route of about 200 m was deployed to measure the elevation change across the scarp. 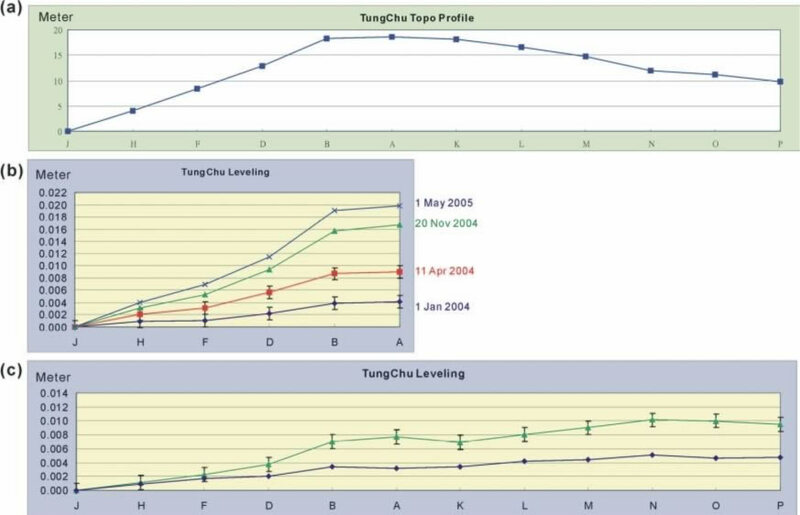 Figure 37 shows the results from the leveling. 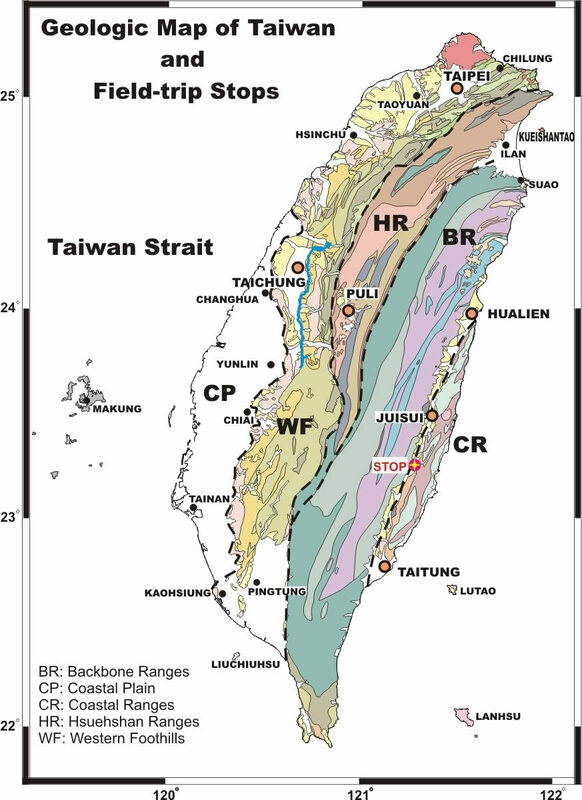 Topographic profile (a) and results of leveling (b) and (c) across the fault scarp in the Tungchu area. Note that the distances between the benchmarks are in approximation. The result of figure (b) shows the elevation change after 2003 M 6.5 Chengkung earthquake in the western limb of the hills, indicating a clear increase of uplift toward the hanging wall. A more long leveling route across the hill (c) shows that the eastern limb of the hill probably corresponds to erosion effect instead of fault motion (compared to Figs. a and c).